Looking for a new furever friend? Adopt a rescue dog at our Dashing Dog Rescue Pet Adoption Event this Saturday, October 8th from 10 am to 2 pm. Dashing Dog Rescue is an all-breed rescue group with a board of veteran dog rescue volunteers. The group takes in dogs from local shelters, places them in foster homes, gets them vetted (spay/neuter, microchip and shots) and finds permanent homes. Dashing Dog Rescue is a no-kill group. 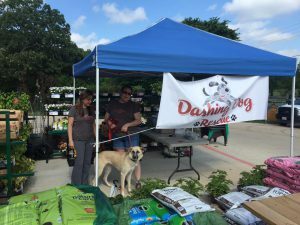 Dashing Dog Rescue’s mission is to create a positive, fun and rewarding experience for volunteers as well as the dogs they serve. The group operates in the Lewisville/Carrollton/Flower Mound/Highland Village/Lantana area. For more information, visit Dashing Dog’s website and Facebook page. This entry was posted on Tuesday, October 4th, 2016 at 3:46 pm	and is filed under Events, News & Updates. You can follow any responses to this entry through the RSS 2.0 feed. Both comments and pings are currently closed.